This will be the first official Pixelayer outing with friends to promote friendship and to help each other. Please share this excited day out with Pixelayer and Friends. We would like to invite all of you no matter DSLR user or compact user, videographers or painters, and good news to modelling enthusiast who want to improve their poses. Feel the excitement and register with us before 12th of April 2010 (extended to 15th April 2010) for us to arrange with the meals & beverages. Since there is a limitation on the participation, we need your co-operation to bank in your RM20 to us before or on the dateline to book yourself in this event. There will be a group competition and mysterious gift to be won! Kindly refer below details for your reference. Where: Tuaran, Sabah, East Malaysia. Time: 0830 - 1830 hrs. Agenda: Open photography, from macro to portrait, street to urban, vivid to black and white. 03:30 pm: Heading to Transit D’Dalit for Tea Break. 04:30 pm: Heading to Rasa Ria Resort, Tuaran. Thank you for all the support upon us and Pixelayer couldn't have made it without you. If you are interested, please send your details as below to pixelayer@yahoo.com or you may drop us a message if you are not clear about the event. Don’t worry all your details will be safe with us. We hate spammers too! Copy & send us your details as per below at pixelayer@yahoo.com and we will advise you the account number in order for you to bank in RM20 and book your name in. *Thank you for those who already booked their participation and looking forward for this Sunday event. 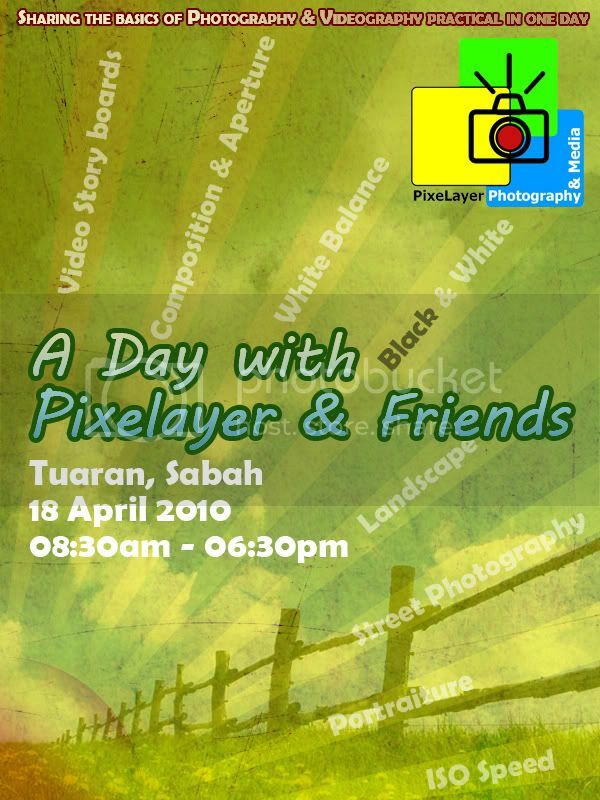 Extra information that you should know, there will be one special guest who fly all the way from Kuala Lumpur particularly for this event with loads of years experience to share in Film & Photography that you should not missed and the most excited part is after this day out activity, all the participants will be given a chance to win 'A Day with Pixelayer & Friends' T-shirt! How to win this competition? Easy as ABC. a) Participate in "A Day with Pixelayer & Friends"
b) Only participants can pick their best photos on "A Day with Pixelayer & Friends" and publish it according to category given at "Pixelayer Photography & Media Group" for voting. c) At the end of 15 days, the highest 'Likes' and comment will get a T-shirt of "A Day with Pixelayer & Friends" courtesy of Pixelayer Photography & Media team.